Don’t get me wrong. I love the Philippines : it’s inevitable not to love my own country. Whether or not I conform to the general Philippine culture or rebelled against it, it shaped me into the person I am now. My family and friends are all in the archipelago. 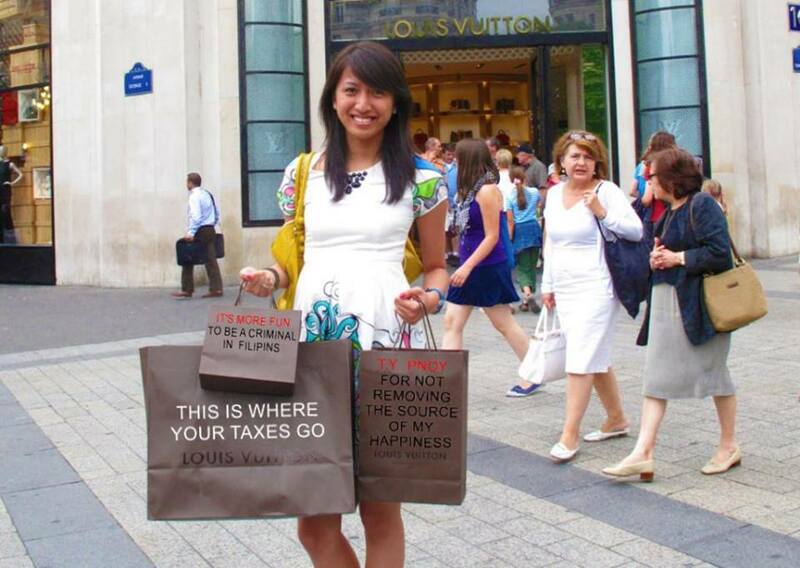 But for me, the Philippines should be more of a vacation spot than a place to earn a living. You know, that once or twice a year thing you want to escape to when it’s 2 degrees outside? Here’s the mrt queue. Enough said. So take a cab, you say? But the cab drivers make it their mission and vision to rip customers off. So you try to forego that as much as you can, thank you very much and drive. What is supposed to be a 10 minute drive takes an hour. And wait, just when you’re about to turn right, barely 200 meters from your destination, the jeep ahead of you stops, causing you to hit on the break. And while your own passengers are thankful for the invention of seat belts, you watch in annoyance as the jeep starts unloading fifteen passengers. You fume and start tapping at the steering wheel, wondering if you should honk. Yes honk away. The jeepney driver gives you an evil stare as if it was your fault! Aha. So it’s not me. It’s actually normal to feel stressed when one is not in control. Yes, the Philippines stresses me out. So I’d rather go for a vacay alone, where time is not of the ultimate essence and I can just retreat to the lazy beach town of Baler. At the very least, the waterfalls don’t clock-in your arrival. The waves continue to roll. You tell your latecomer friends – namely, most of them – that if they want to catch a glimpse of you, they better get their fat asses to Baler. So, unpredictability in everyday life = more stress… understandable. What else? Second thing I can’t take : the (lack of) transparency of the jobs. What are you actually signing up for? b)they assume that you will sell yourself short. I’ve been handed a job offer more than once a couple of times where the offer was much, much less than I was demanding. God, didn’t you read my demand on the form? You’re offering to pay half of what I am getting now! You should have told me from the very beginning so I could have had a wax instead. But no. I spent the whole afternoon for this! This! It all could have been much easier (and fairer) if they published the salary . In Japan, they publish everything. I don’t know if this is by law, but it makes deciding on which job to apply for easier. During the interview, it is not a taboo to ask how much you are going to get paid – in fact, it is the employer’s obligation to inform you so you can make informed decisions. Why? Because majority of us work to make some money, we don’t work out of the generosity of our hearts, and Japanese /American employers understand that. In the Philippines, they refused to answer my question about salary during the interview process. It’s a secret we can’t divulge! The norm is : you waste my time, I waste yours. 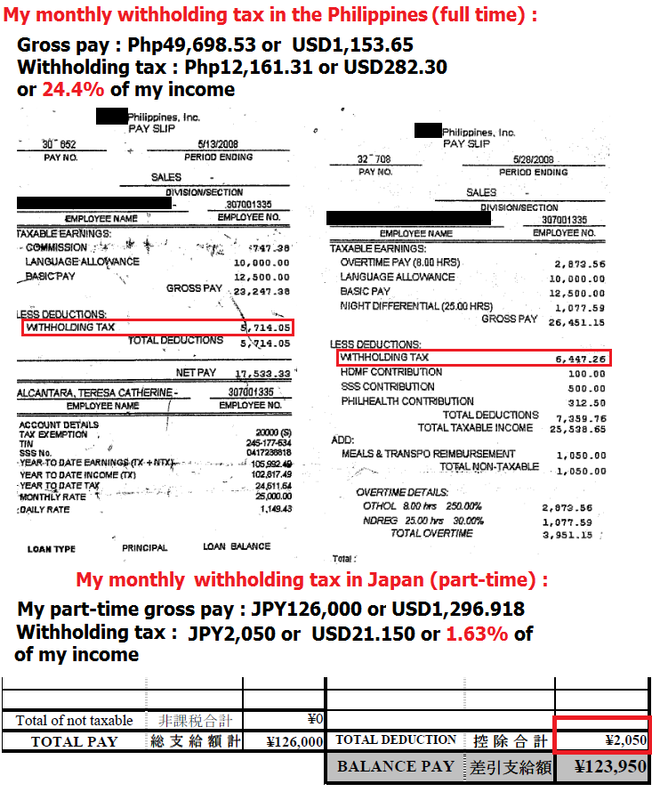 Granted, I was working part-time with another source of income and that I was (and still am) a “dependent” of my husband here in Japan. Still, looking at the amount of taxes I paid in the Philippines and seeing the pathetic state of our roads and the airports, I can’t help but feel enraged. It’s no different from philandering husband who doesn’t treat me right taking almost 1/4 of my income. While I break my back working, the ungrateful husband embarks on the road to self-destruction, debauchery and corruption. So I leave you Philippines, not only for greener pastures, but for a new, foreign husband who loves me and treats me right. I will continue to love you from a distance and visit you from time to time, such is fate, but I will do my best not to pay as much taxes as I have to. For what? For her? So she can shop and throw parties? Spot on! My god transparency is so damn rare in the Philippines with anything. A strategy to screw you over. Punctuality is also foreign. Perhaps it is the outside perspective that pinoys need to demand more from the government. Being stuck in the system inherently makes all those issues familiar and hence normal not to be changed. You know I think there’s pangbabarat going on, on the part of the employers. That’s why they don’t want to publish the salary. The salary level in Japan is very transparent, even within the same company (there’s a fixed table of yearly salary based on tenure which anybody can view via intranet, in the case of my husband’s company). And punctuality – I find it rude to be late. And my problem with many Filipinos is even if they are the one who set the time, they are late!!! Can’t stand it! 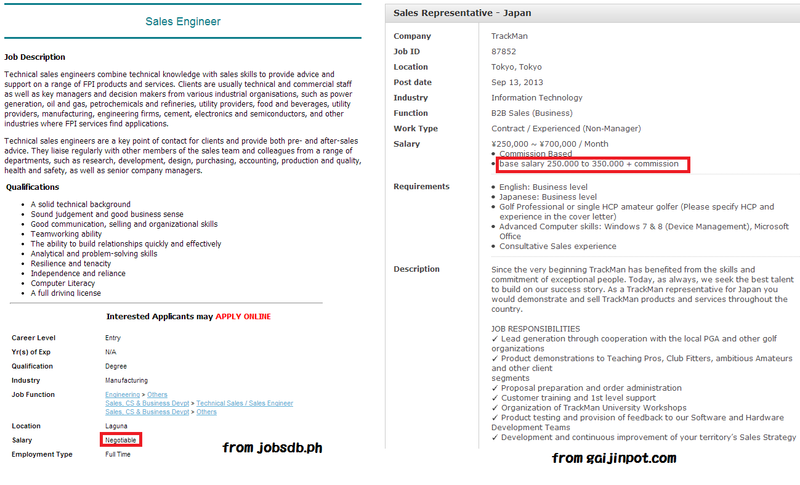 This entry was posted on October 9, 2013 by ikalwewe in Uncategorized and tagged abroad, japan, job ads, jobs, late, latecomers, ofws, philippines, pinoy, punctuality, residents, stress, stressors, tax, unpredictability, withholding tax, work.